Last week’s parliamentary elections in the Maldives have put the Indian Ocean archipelago on a new path, the path of true democracy in which State institutions will function as they ought to. From 2008, when the Maldives got a new democratic constitution, till the end of 2018, when virtual dictator Abdulla Yameen was unseated in a Presidential election, Maldivian politics was pretty much the same as it was under long-standing dictator Maumoon Abdul Gayoom. The only change was that the President was democratically elected. For the rest, it continued to be one-man rule with the political class from the President down to the members of parliament unabashedly looting the State and squabbling over the spoils of office. But since the parliamentary elections of April 6, 2019, there is more than a glimmer of hope that things are changing for the better. There is a chance that Maldivian politicians will take the cue from the voters and strike a new path, in which power will be exercised in the service of the people and not to grab more power and use it serve narrow personal and partisan ends. The April 6 elections were won convincingly by the Maldivian Democratic Party (MDP) which had earlier spearheaded the long and hard struggle to end the long-standing dictatorship of Gayoom in 2008 and had fought the Abdulla Yameen constitutional dictatorship between 2013 and 2018 tooth and nail. By the morning of April 8, the MDP had won 64 of the 87 seats in the Majlis (parliament). The Jumhoory Party (JP) led by parliament Speaker Gasim Ibrahim won seven seats, the Progressive Party of the Maldives (PPM) got 5 and its twin Peoples’ National Congress (PNC) got two. The PPM and PNC are led by former President Abdulla Yameen. Yameen’s dismal performance despite getting 41% of the votes in the September 2018 Presidential election, shows the radical change taking place in the thinking of Maldivian voters. While Yameen fought on the plank of giving the Maldivian a strong government to enable rapid economic development, basically a repetition of his regime from 2013 to 2018, the MDP fought on the basis of a progressive and democratic manifesto under which the State would not be a Leviathan but a caring and transparent agency. High on the agenda was the dismantling of the centralized power structure inherent in the Executive Presidential system. The tendency of leaders to misuse the office of President for self-aggrandizement and ride roughshod over opponents, rivals and critics had to be ended. According to Hamid Abdul Ghafoor, international spokesman of the MDP, the government will now speedily usher in the parliamentary system and make the Chief Executive (the Prime Minister) answerable to parliament. The existing Executive Presidential system, with a high concentration of power in the hands of the President (though directly elected by all Maldivians), had led to misrule, unbridled corruption and manipulation of all institutions of the State. Fortunately for the MDP, the incumbent President, Ibrahim Mohamed Solih, and the newly-elected parliament are on the same page. Solih is MDP and parliament is now overwhelmingly MDP. This will make the change over to the Westminster system easy. Solih is a quintessential democrat who prefers to rule by consensus rather than diktat. 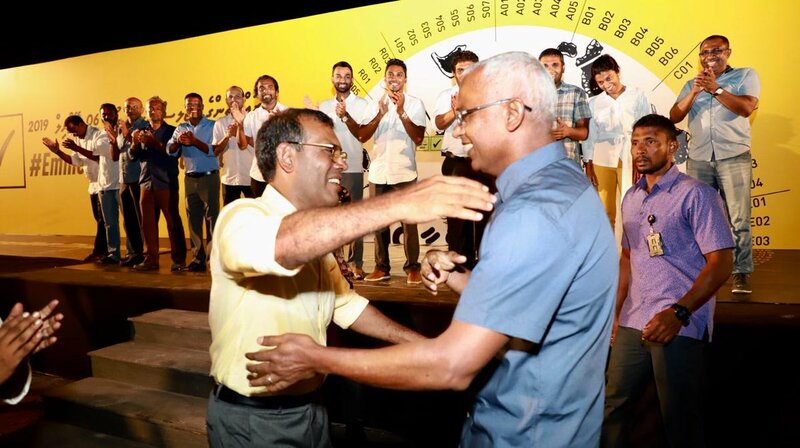 If the change over to the Westminster system does take place, Solih is expected to be a ceremonial President with real power being exercised by former President Mohamed Nasheed who is expected to be the Prime Minister. The second plank was the ending of the system of corruption which had eaten into the vitals of all institutions from the Presidency downwards. MDP spokesman Ghafoor describes the Maldivian political system as a “kleptocracy” and the typical Maldivian politician as a “kleptocrat”. The MDP’s aim is to destroy the kleptocratic structure root and branch, he says. Indeed, President Solih’s first words after his party’s victory was that the people have voted out corruption. The third plank is to liberate the political system from the clutches of rich businessmen. After the MDP victory. former President Nasheed said that the days of “rule by Rolex watches and Kohinoor diamonds” were over. It was therefore not surprising that the MDP had broken with the Jumhoory Party led by tycoon Gasim Ibrahim, who is the archetypal Maldivian businessman-politician. The fourth plank was the overhauling of the judiciary, which had been systematically subverted by successive governments. Given the democratic credentials of MDP leader Nasheed and President Solih, the Maldives could see a more evenly spread out economic development. The government is likely to eschew expensive, grandiose and allegedly kickback-ridden projects built with Chinese loans. Government is likely to be more transparent in regard to deals with foreign countries, especially China. Relations with India are expected to be given top priority which will ensure that New Delhi and Washington do not get jittery and turn the world against the government. One of the most encouraging features of the current political situation in the Maldives is the equanimity with which President Solih and other leaders of the MDP, especially, Nasheed, are handling ticklish issues. MDP leaders have also shown remarkable unity. Rumors that Solih will sideline Nasheed once be became President, proved to be untrue. Significantly, even after the stunning electoral victory of the MDP, President Solih’s cabinet will continue to have representatives of the now-defunct coalition which defeated President Yameen in the September 2018 Presidential election. “This is as per an understanding already arrived at. We do not want to upset the apple cart unnecessarily. Stability is the need of the hour. The Jumhoory Party, which fought against the MDP in the parliamentary elections in alliance with Yameen’s PPM, will continue to be part of the Solih cabinet,” explained Hamid Abdul Ghafoor, spokesman of the MDP. The April 6 elections have brought about much-needed stability to the Maldives, a feature the country had not experienced since the first democratic election in 2008. The first democratically-elected government of 2008, headed by President Mohamed Nasheed, was overthrown in 2012 by his own allies such as the Jumhoory Party and the Adaalath Party in conjunction with former President Maumoon Abdul Gayoom, his half-brother Abdulla Yameen, and the chiefs of the army and the police. The first parliamentary elections held under the new constitution in 2009 had thrown up an unstable combination parties which hamstrung President Nasheed. President Yameen made up for lack of numbers in parliament by crass manipulation using emergency powers as well as money and muscle power. But Yameen’s tactics alienated the masses who rejected him in the September 2018 Presidential election. Yameen was defeated by Ibrahim Solih of the MDP, backed by a grand coalition of opposition parties. But this coalition was not built to last as it had disparate elements in it. Therefore, from the very beginning, the MDP was clear that it would fight the April 2019 parliamentary elections alone and secure a good majority. The MDP was particularly keen on not having the Jumhoory Party (JP) of Gasim Ibrahim in its camp as the JP was known as a party based on money and muscle power and that basically it was interested in making money by using State power. As expected, the Jumhoory Party left the coalition and linked up with the discredited PPM and PNC led by former President Yameen. Former President Maumoon Abdul Gayoom and the Islamist Adaalath Party stuck to the MDP coalition. But neither the senior Gayoom nor the Adaalath Party are an internal threat to the MDP-led coalition, given the MDP’s overwhelming numbers in parliament.